Today I'm here to tell you a story of what happens when I attempt to actually follow a recipe. And no, this fluffy pillow of caramel banana heaven is not the only thing that happens. Unfortunately. See, I have this recipe from my great aunt Pat. I was going to be really cool and follow the recipe with only a couple of minor adjustments. When I was done mixing the batter, I was like, "Okay, so this didn't make much, but maybe it will quadruple in size in the oven." When I got done baking I was like, "Okay guys, there is something seriously wrong with this cake. It looks really freaky." But no matter, on to the frosting. So I was digging around in the cupboards for the sugar and I was like, "Where did I put that sugar? I mean, I just used it for the.... for the... for the..."
So it was then that I realized I had not in fact used the sugar for the cake. I was so distraught that I immediately smashed the sugarless cake in a furious and maniacal frenzy. No matter. While the new cake baked, I whipped up some caramel for the frosting. The second cake came out looking like a dream come true so I drizzled on my beauteous caramel frosting. Then I sprinkled on some toasted walnuts just for the heck of it and called it a success. So I guess the moral of this story is that sugar is important. But we already knew that. Preheat oven to 375ºF. Grease a 9x13 inch pan and dust with flour. Stir together the flour, baking powder, baking soda, salt, and sugar. Mix in the butter until incorporated. Mix together the egg, bananas, buttermilk, and vanilla and add to the flour mixture, stirring just until combined. Pour batter into prepared pan and bake for about 25-30 minutes or until a toothpick comes out clean. Combine the sugar and corn syrup in a saucepan on the stove. Cook over medium high heat until caramel colored. Add the heavy cream and 1/4 cup of butter (half of the stick). Add the salt and vanilla. Cool to room temperature. In a stand mixer, beat the caramel in a stand mixer. Cut the remaining 1/4 cup butter into cubes and beat in until combined. Alternately add the powdered sugar and milk and beat well. It should be thick and smooth (add more milk or powdered sugar until desired consistency is reached). Drizzle the frosting over the cake. Don't try to spread it, it will just stir up crumbs from the cake. 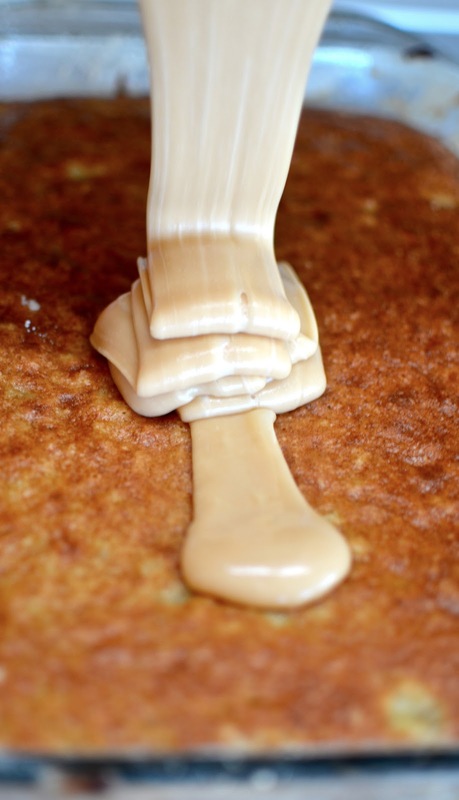 Try to drizzle it pretty evenly over the cake and it should slowly spread together. Sprinkle with some toasted walnuts if you want.